The goal of this question is to explore what the correlation is between the cost of the total energy consumption behind a PoW-based cryptocurrency and its price. Obviously, the cost of mining cannot be lower (in the long run) than the price of the coin, because more and more miners would join. But is the converse (empirically) also true? Has the price of coins been historically bounded from below by the cost of mining? Of course, the cost of mining is hard to compute, because of differences in hardware, electricity price and cryptojacking. Yet, one can find some nice charts here about Bitcoin, so some estimates can be made. Has anyone looked at this? For example, the market cap of Bitcoin is about twice the market cap of Ethereum. Is it true that about twice as much energy is/has been spent on Bitcoin than on Ethereum? I was just thinking about this today and created this spreadsheet to model my question. Not the answer you're looking for? Browse other questions tagged mining-profitability exchange-rate currencies or ask your own question. How does bitcoin's price volatility compare to commodities/stocks with comparable market capitalizations? 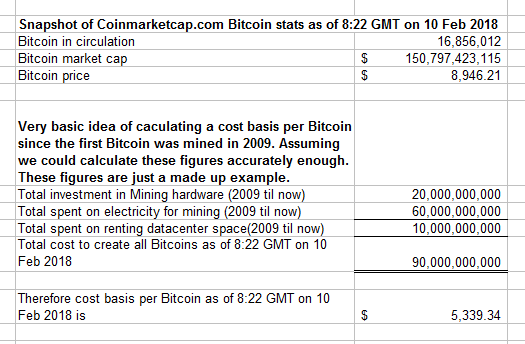 Calculating the current price of 1 BTC? What will bitcoin prices do in the next months as ASIC miners become more widespread? Do Bitcoin futures contracts affect Bitcoin price?